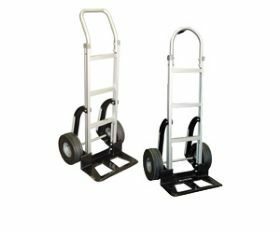 Heavy-duty aluminum hand truck designed specifically for the delivery professional. Innovative No-Tip design and super strong aluminum-steel alloy nose plate keep loads securely on this truck. Patent pending 4" x 10" extra wide air chambered tires ensure a smooth ride over any terrain. 1000 lb. capacity. 50" H. FOB Shipping Point. Product No. Handle Style Wt.(lbs.) Price Ea.